Green is such a refreshing color. It is the quintessential color for spring because the trees and flowers bloom back to life in a sea of emerald. Currently in North Carolina spring is in full swing! I thought the thriving scenery of downtown Fayetteville would be the perfect location to shoot my latest collaboration. I am so excited to share these photos from my work with Coach featuring the Dinky Bag. I must give credit where it’s due because my photographer Matthew Wonderly got all the right shots in the best lighting even though it was raining. Also my hair and makeup stayed in tact thanks to the wonderful Brittany Campbell of Sunshine Makeup Artistry. In a few pictures I look a little wet or my bag does too, but I think it adds an aspect of realism – sometimes you just get caught in the rain without an umbrella! And this is what I look like when that happens hahahah!! Of course after we finished shooting a few hours later the sun came out with blue skies and it was a beautiful day. Fashion blogger problems. Either way I’m really impressed with these pictures, especially the detail shots. I have a vintage Coach Dinky Bag that I have used in other photo shoots. It’s really cool to see the two bags next to each other! My vintage one is brown leather and my new one is in a shade of pistachio. I wonder what Coach was trying to tell me when they put a little devil charm in my purse as a present. Each Dinky Bag comes with a unique charm that you can style your purse with. I know these charms are chosen at random, but I like to think Coach knows about my devious side. Sometimes I can be quite the sour patch kid, if you will. I am very sweet but I definitely have my sour side – just ask my fiance when he wakes me up early on the weekends, hehehe! Below you can see all of the photos from my shoot with Coach. Let me know in the comments below – what is your favorite color for spring? Thank you Coach for sponsoring this post! That bag color is just to die for!!! It looks incredible with your dress! Thank you so much! I had originally bought the dress to match a pink bag but I think the green suits it better 🙂 Thanks for your sweet comment! Perfect shade of green! Love those photos too. 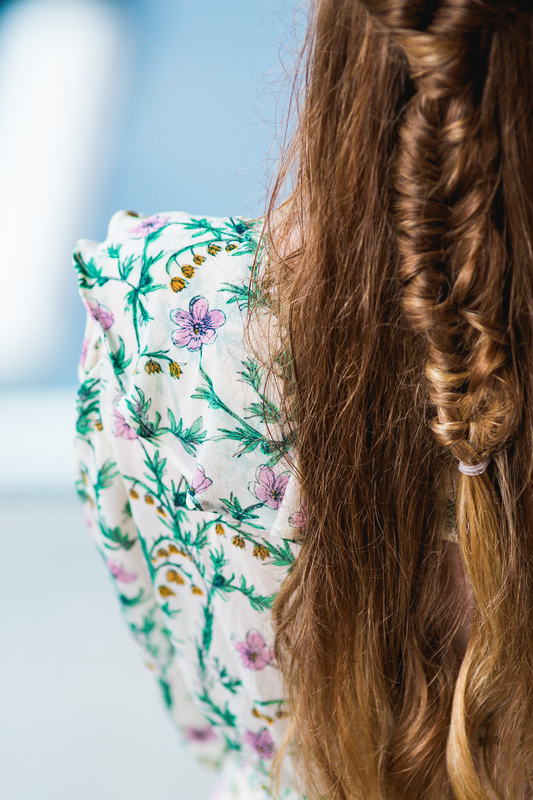 And of course, your braids are on point. Coach brings me so much nostalgia as well. LOVE this bag, such a fun and great color!! And can we talk abt your fishtail?!?! So perfect with this outfit!! Your photos are beautiful, and love your outfit! Thank you! It’s definitely my new wardrobe staple. Thank you so much! My hair style was one of my favorite aspects about this look. This bag has me green with envy haha! Love this little bag! And you styled it perfectly with the dress! Thank you Anna! It is such a cute bag and comes in a lot of fun colors. I’m glad I went with the pistachio color because it’s perfect for spring! Ok 1- you have gorgeous mermaid hair 2- you should be on America’s Next Top Model 3- I love this bag 4- you’re the cutest! That coach bag is adorable! I love the bold green color. Coach has been one of my favorites since I bought my first bag in middle school. As an adult I see so many options now. I’m so impressed with their Spring/Summer 2016 collection. Thanks so much for your comment! All I can think is WOW!!! WOW!! WOW!!! You never cease to amaze me with your photography, writing and outfit/hair choices! Stunning post! keep up the AMAZING work!! Thank you Gail! You are so nice. I had a fun time with this shoot despite the rain! LOVE this whole look! The green is fabulous! ps- I have those shoes in black, they are my fav! i love the bright color of that bag!!! and so easy with the crossbody strap. perfect for summer. and of course!! that hair. obsessed!!! You know I love my sneak peaks, hehe! You should totally get these DV Target shoes! I love them and wear them to work all of the time. My Dinky is my new favorite bag!! It fits my wallet, keys and a pair of sunglasses so it’s the perfect on-the-go bag! And the charm is sooo cute isn’t it?! Seriously girl, you’re killin it. I love the shades of green and blue in your outfit. They are my favorite colors to wear. 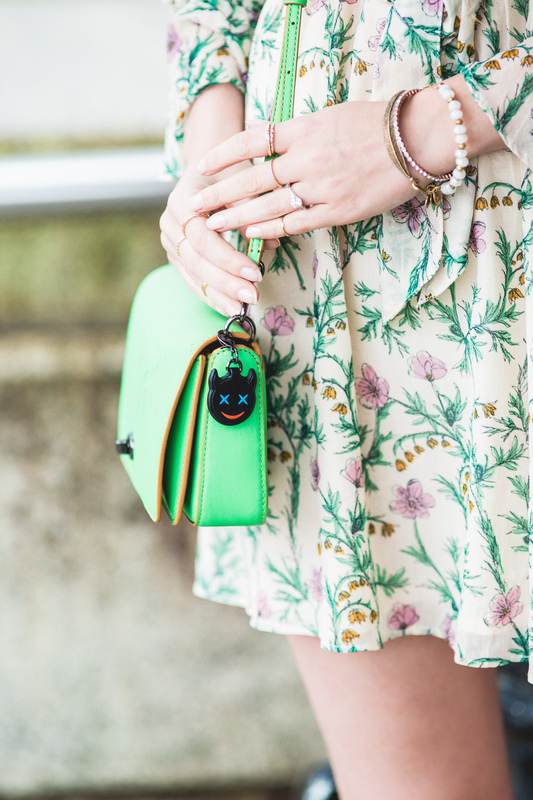 That Coach Dinky Bag is perfect for a spring day! I love how it’s vintage too. Congratulations on the partnership! It’s so wonderful to connect to a brand like that and feature them in such an amazing way! I was so excited when they reached out to me! Thank you so much for your wonderful comment, I always look forward to hearing from you! You look like a dreamy porcelain doll in these pictures. Absolutely gorgeous. I actually really like this bag by Coach. For a while there I hadn’t even been paying attention to their stuff but this line looks modern and totally wearable! That is quite the compliment for my fair skin 🙂 Thank you! And I agree that when Coach rebranded they totally reinvented their style and now they are 10000% a brand to watch! And they show at NYFW!!! Taylor, you blow me away!! 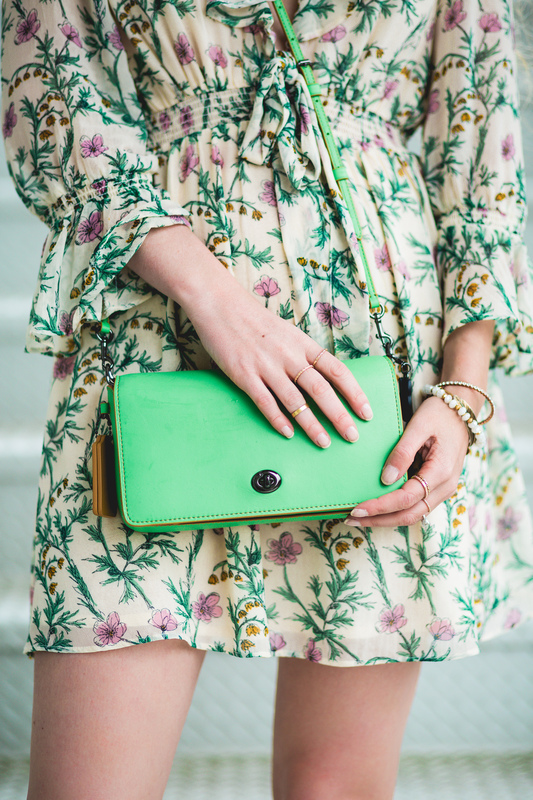 The pop of pistachio is so perfect and you styled it impeccably! GORGEOUS! I love the pistachio color too, thanks so much! OK, seriously…between your gorgeousness, these photos, your hair and that bag….such a great post!! 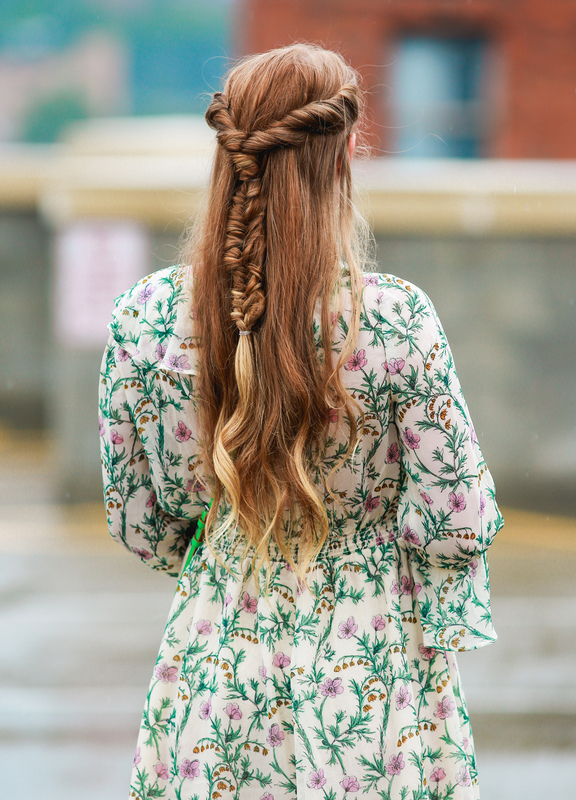 I love this style post – so pretty! And your hair (LOVE). The photography is amazing as well. All in all, fantastic post! Thanks for stopping by Anna! I appreciate your sweet comment! 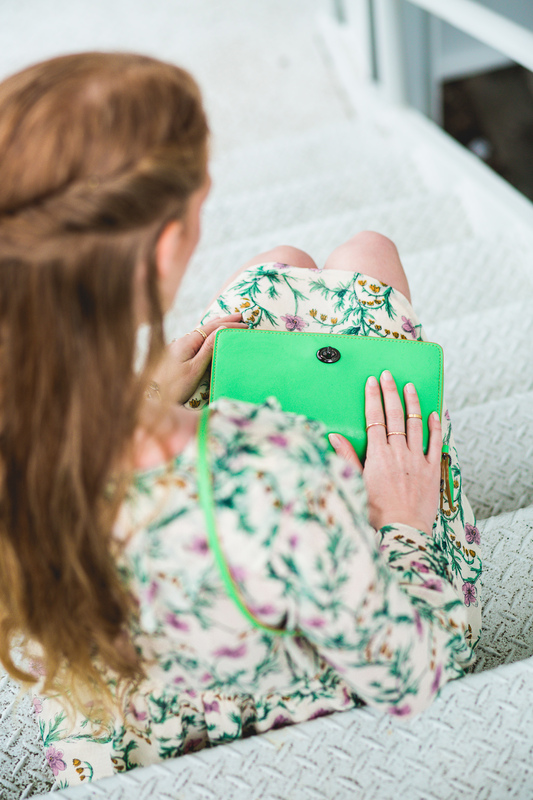 Love that dress on you – green is SO your color! Great collab too, this is PERFECT for you!!! Thanks girl! I like experimenting with new colors and green is definitely out of my comfort zone but it worked so well for this shoot. I seriously love this bag! The colors are perfection! 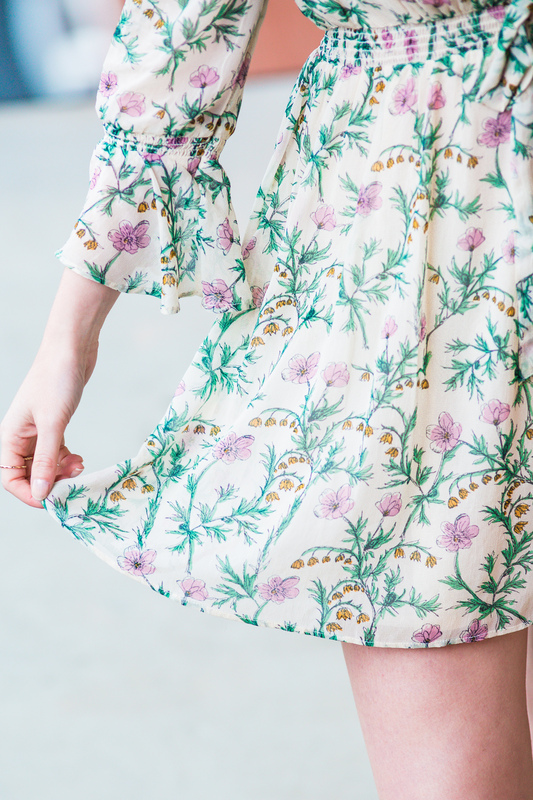 I’m loving your dress and I’m not even much of a floral girl. Also you hair is amzing! Thank you! Neutral color tones are the best! This bag is a must have! The quality look amazing and that color…perfection. Thanks for a great recommendation. I love these pictures!! 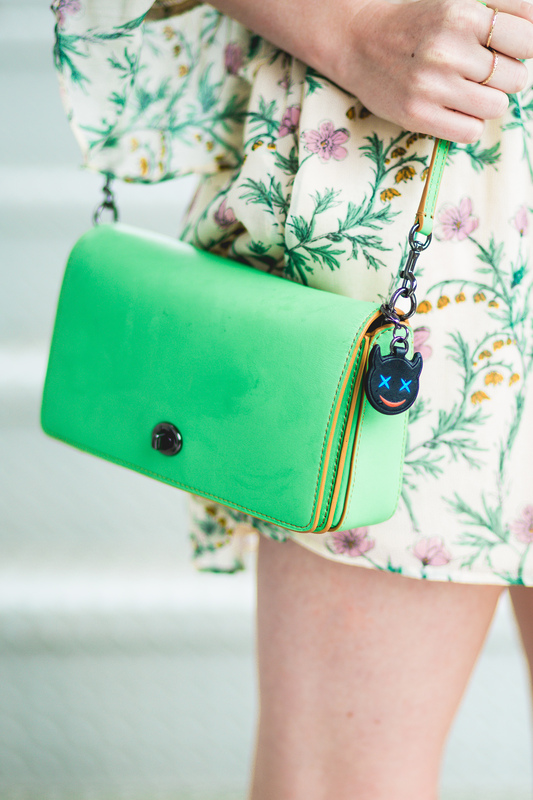 The purse is seriously adorable in that color… and your hair is stunning! Thanks Jenna. I’ve been using this purse almost every day! It’s perfect for running errands. Thank you! I think green is such a great color and it gives off such positive vibes. I’m so glad you liked this shoot! Heylo fellow North Carolinian… I’ve been wanting to stop by and drool over these photos for some time now. I LOVE this outfit. The green is awesome with your gorgeous red hair and the bag finishes the look. Great styling Taylor! Hey girl! Thanks so much for your sweet comment. I love this green color so much! I recently bought a mint Coach bag too and I’m obsessed with it! I really love your dress! Taylor, I really like that coach bag! Green is definitely perfect for summer!! Indeed, green is so great! I simply want to tell you that I am just newbie to weblog and definitely enjoyed you’re website!